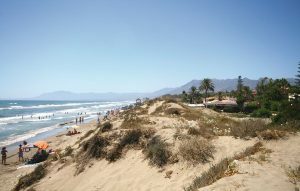 Steve Nicholls travelled to Malaga from stansted on the 25/10/18 and stayed in the resort of Elviria near Marbella. His 35 min journey to the Marriot Resort with driver Nigel at a cost of 120 Euros return. You can pay on arrival and we offer free child seats. Steve answered 8 questions giving five fives, one three, and two twos. He rated the accommodation, places to eat, pool and pool suitable for children, and things to do in the daytime all a five. He added the nightlife was average and gave it a three, also the beach was poor and not suitable for children giving it a two. Steve stayed for ten nights stated that there was no need to hire a car and the pool and accommodation were suitable for disabled travellers. Steves favourite restaurant during his stay was Sinbad’s which is a restaurant and beach bar with views of the sea. Serving a wide variety of fish seafood and meat dishes Sinbad’s also has live music and entertainment. Zoe Brennan arrived in Malaga 26/10/18 was collected at Malaga Airport by driver Nigel for her four night stay. Staying at the Gran Guadalpin Hotel in Puerto Banus . Zoe partically liked the Hotel and its pool area which was also suitable for children and disabled guests and gave it an excellent rating. She gave the beach area which was a two minute walk from the hotel very good rating. The nightlife and things to do in the daytime were also very good. Zoe would defiantly return to Puero Banus and the Hotel Guadalpin . Her favourite bar whist staying in Puerto Banus was the bars situated in the Hotel she didn’t state which bar as the hotel has three bars. One a sports bar , sofia bar serving cocktails and a pool bar. Zoes favourite restaurant was Jacks Smokehouse which is situated front line on the popular Puerto Banus marina . Inspired by the best smokehouse restaurants in America, Jacks Smokehouse brings a New York feel and concept to Puerto Banús. It offers an authentic BBQ experience within a contemporary setting. Here you will find a mouth-watering selection of cured and dry-aged meats that are lightly seasoned and slow cooked in smoked wooden fire pits by their pitmasters to create the very best tender BBQ flavour.